When you think about the future of 3D printing, pasta probably isn’t the first thing that comes to mind. But the chance of a lifetime to print custom pasta shapes is a reality that may soon be coming to a restaurant near you. With 3D printed chocolate and candies already under the spotlight, the next big thing to hit the 3D food-printing sector appears to be none other than 3D printed pasta. 3D food printers now have the ability to design any noodle shape and printed it, which promises to shape the future for all pasta lovers. With a few test models already in place in restaurants in the Netherlands, fourth-generation Italian family business Barilla, along with Dutch research company TNO, hope that 2014 will be the year for 3D pasta printing. TNO has made advancements with the speed of 3D pasta printing, but it is hoping to increase the speed even more. According to Barilla, since development started, the print speed now is ten times faster than when they began two years ago. According to 3D Printer Plans, Barilla is one of Italy’s leading food groups and is a world leader for pasta. 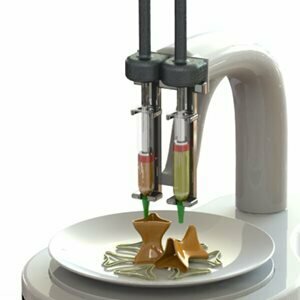 It is the first large food corporation to see the potential in 3D printing food and they expect that food printers will someday be found in every kitchen.